Marco Island, Florida, is one of my family’s favorite beach spots, especially when we’re ready to escape long overcast Midwest winters. If you’re looking for a gorgeous, warm, family-friendly beach getaway, it is a great choice. 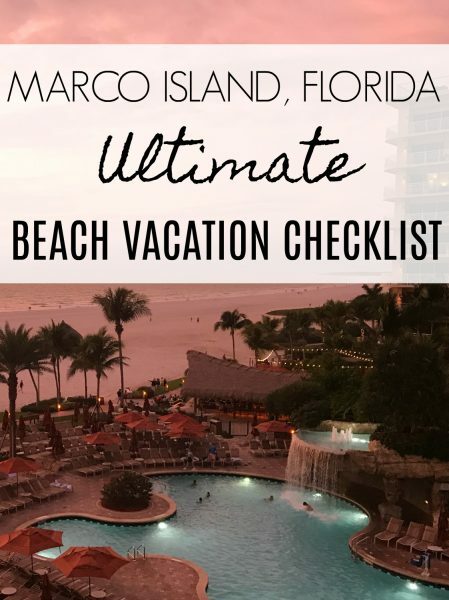 Marco is a beautiful island with crystal clear blue waters near Naples, Florida, and is about as far south as you can go in the state before reaching the Florida Keys. With several beach resorts on the island, this laid back community makes for the perfect beach vacation: sunny, warm, natural and luxurious. TripAdvisor even named it the No. 1 Island in the U.S. in 2014! Where is Marco Island, Florida? Marco Island is located along the Gulf of Mexico in the Florida Everglades. It is just south of Ft. Myers and Naples, which together are known as the “Paradise Coast.” It is also the largest inhabited island within Florida’s Ten Thousand Islands. Here are some other great West Coast of Florida beaches. 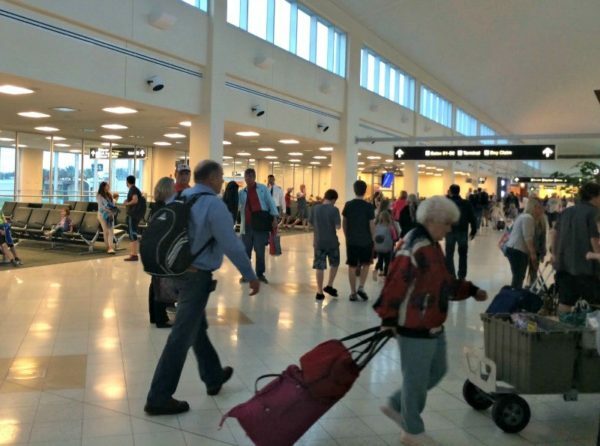 To get to Marco Island, it’s easiest to fly into Southwest Florida International Airport (RSW) in Fort Myers. This is a small and fantastic airport that is easy to get into and out of with usually short check-in and security lines. From there, you will need to rent a car or take a shuttle, taxi or Uber onto the island itself, which is about an hour’s distance south. You can find lots of cheap flights on Southwest Airlines to Fort Myers and you can even fly there free on Southwest! Just download my free step-by-step guide below on that shows you how to fly nearly free anywhere in the U.S. on Southwest with the person of your choice joining you FREE! Alternately, you can take a charter flight into Naples Executive Airport or Marco Island Executive Airport. Learn more about the different charter companies who operate out of that airport. It’s convenient to drive onto the island and to Naples via I-75, which of course runs from Ohio down through Florida. Take Exit 101 for State Road 84 off I-75 to get to the island. Coming from Miami, drivers can take US 41. Whether driving or flying, here are some great travel games for kids and some top road trip games while you’re headed to your destination. 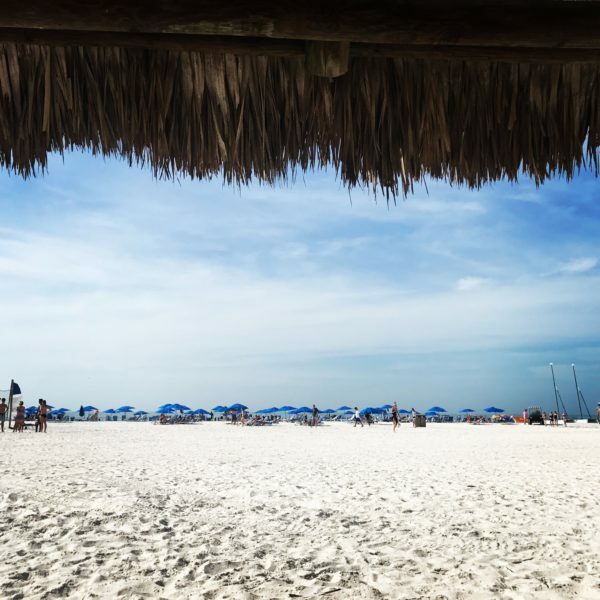 Credit Jeff Herron – We love the wide beaches on Marco Island, and getting a beach hut for the day makes it even more awesome! 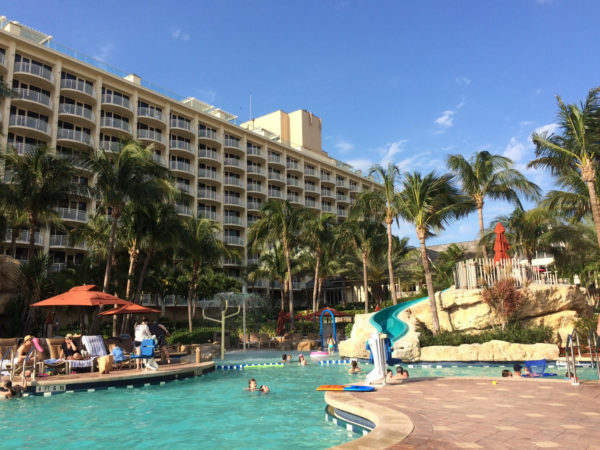 There are several Marco Island resorts, and my personal favorite is the JW Marriott Marco Island (formerly Marco Island Marriot). The resort became a JW Marriott on January 1, 2017 and is absolutely first class. You truly never have to leave this Balinese-style resort (reminds me of the Polynesian at Walt Disney World) to be entertained for a week! Almost all rooms have decks with ocean views! Nearly all 726 rooms have ocean views with decks (don’t miss the sunset from your deck! ), and rooms have been newly refurbished with modern design and amenities, including deluxe bathrooms and showers. Choose a suite for a top floor view with an extra large deck and bathroom. 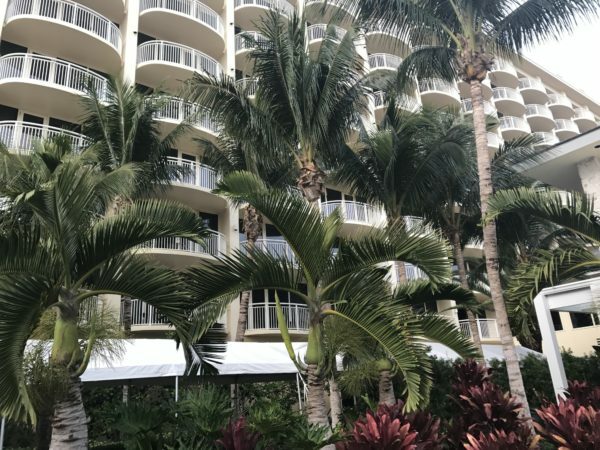 In 2018, they completely renovated their Lanai Suites, which had been closed since 2015 while under construction. If you really want to have a nice stay at Marco, these are the accommodations to book! 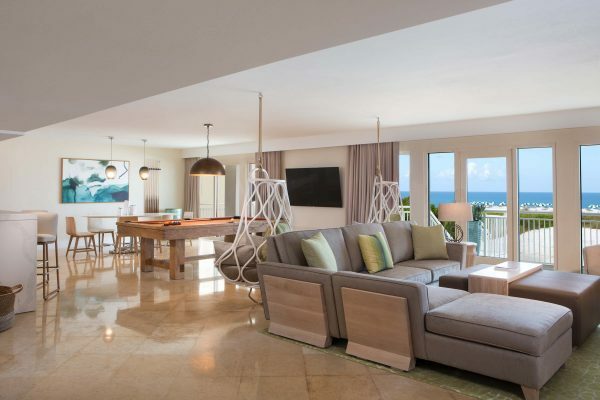 The one- and two-bedroom suites, up to 1,200 square feet in size, have a cabana-like feel with airy decor, spacious living rooms, dining areas and a wet bar and kitchenette, as well as fun details like suspended rattan lounge chairs. Each come with a private patio with beach and pool access. The JW Marriott Marco Island offers multiple restaurants, ranging from 5-Star options to beachside dining to a rum and Tiki bar. There’s even a very kid-friendly walk-up Italian restaurant if you’re on the go. You’ll find four pools, including two very family-friendly options, one with water slides, waterfalls and more. There’s a separate adults pool if you’re looking for a quiet getaway. And, of course, there is the very wide beach with tons of shells and a range of water activities. All guests get chairs and an umbrella as part of their resort fee. 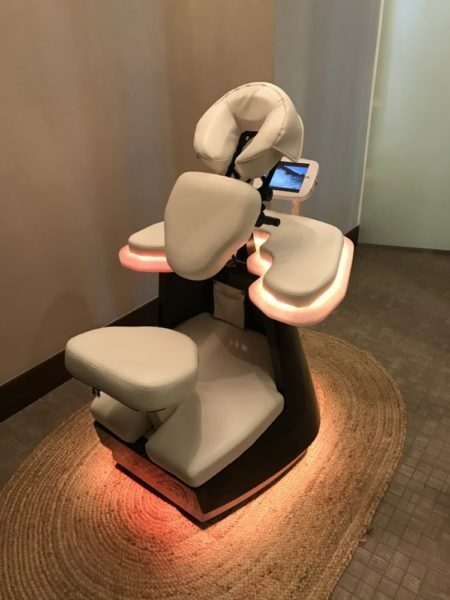 This is one of the most awesome chair massages you’ll ever experience! The Spa at JW on the property is top-notch with workout facilities offering spin, yoga and other classes every week by video or live instructor, as well as all the classic spa offerings and even 12-minute walk-up massages in the most high-tech massage chair you’ve ever seen (there are literally only a few in the world!). The resort also has two golf courses. 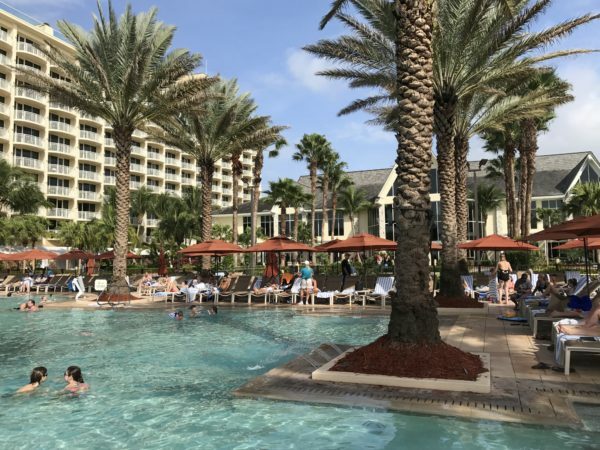 Other hotels and resorts include the Marco Beach Ocean Resort, the Hilton Marco Island Beach Resort and Spa and Holiday Inn Club Vacations Sunset Cove Resort. You can also opt for vacation rental homes or condos through companies like HomeAway, one of our favorites! 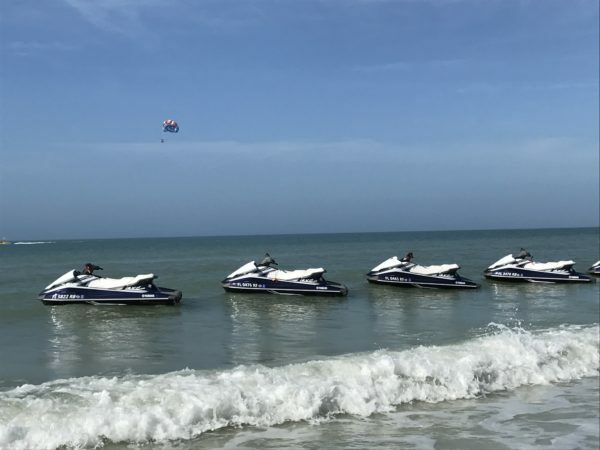 Hop a jet ski right off the JW Marriott Marco Island beach for an amazing tour of the Ten Thousand Islands with dolphins galore! So what’s there to do on the island? So much if you love the outdoors! One of our favorite activities is hopping a jet ski right off the beach at the JW Marriott for a guided tour of the Ten Thousand Islands. Older kids can ride with adults, and you’re very likely to spot tons of dolphin, sometimes RIGHT NEXT to your jet ski. So very cool! We have also seen many birds (the area boasts 200 species), including Bald Eagles, but have yet to spot a manatee, though many people do. Enjoying the beach from a Chickee Hut is absolutely divine! You can also parasail, kayak (the waters of the Gulf of Mexico tend to be calm unless it is stormy), stand-up paddleboard, rent a sailboat or take a guided shelling excursion. Of course, it’s tons of fun just to splash around the beach or spend hours collecting the abundance of shells the waters in this area produce. The JW Marriott has some of the best Marco Island restaurants, including the high-end Ario. Enjoy an all-you-can-eat breakfast buffet at Maia with made-to-order pancakes, waffles, crepes and omelets. Choose from a variety of restaurants — and movies — just down the street from the main hotels and resorts. 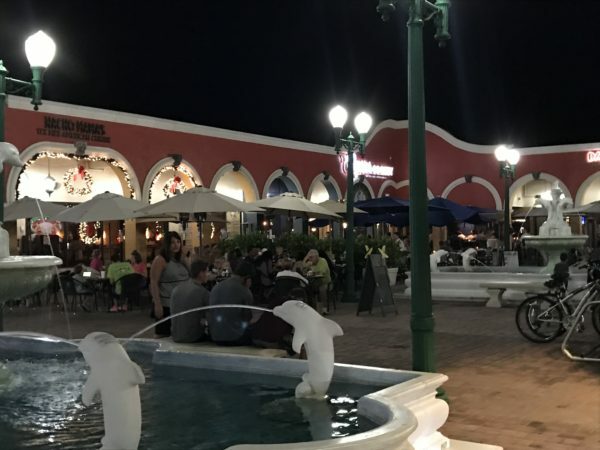 Just a 10-minute walk and near most of the resorts, you’ll find a shopping center with numerous dining options. We ventured out for a lovely walk one evening to dine at DaVinci’s Italian restaurant, which makes its own sodas. I highly recommend their lasagna and chicken Parmesan. Other options include Nacho Mamas Tex Mex, Rookies Bar & Grill, Pinchers seafood restaurant, Marco Prime Steakhouse and Beebe’s Ice Cream for dessert. There’s also several shops in the center, as well as a movie theater should you want something to do on a rainy day or during the evening. Marco Island has one of the mildest climates in the U.S.! The island boasts an amazing 264 sunny days a year and one of the country’s mildest climates. We have been to the area in December and January and enjoyed 70-degree temperatures warm enough to take a dip in the ocean. Average highs during those months are 71-73 with January the coldest month. Pools are heated, so they are plenty comfy any time of year. The best times of year to visit may be spring or fall as holiday months and summer months tend to be the most crowded. Temperatures get pretty warm in the summertime with average highs of 88 in July and August, the two hottest months. My advice? Enjoy all the water activities! Do you struggle with packing before vacation? Download my free packing list below. I developed it because we travel so much, and we use it before every trip! Enter your email to download Go to Travel Gal's FREE packing list and subscribe to my weekly e-newsletter. Success! Now check your email to confirm your subscription. Don't forget to check your spam! There are multiple churches on the island. San Marco Catholic Church is the only Catholic church on the island and is about a 10-minute walk from the resorts. It is large enough to hold large crowds during busier months. Find Mass times at MassTimes.org or via the Mass Times app. You’ll also find Wesley United Methodist Church, Marco Lutheran Church, Marco Presbyterian Church, River Church Marco, the Jewish Congregation, United Church, Family Church and New Life Community Church. 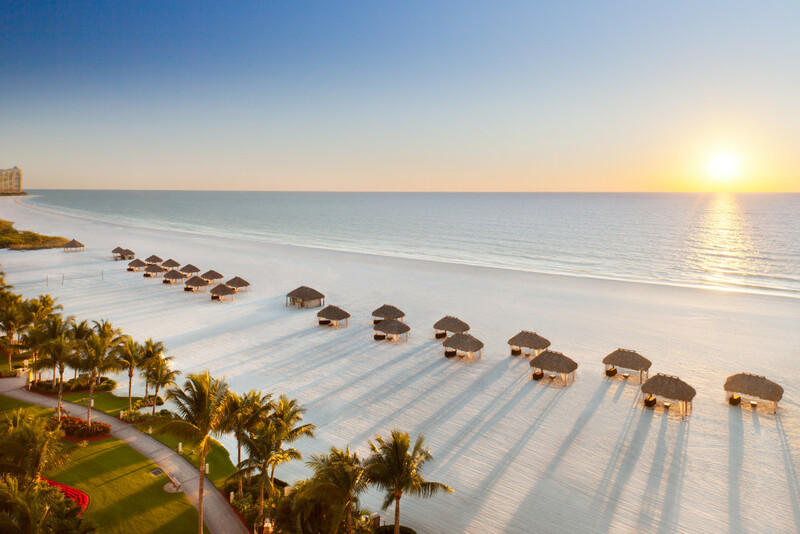 Are you planning a Marco Island vacation? Let us know what questions you have! Here are even more great Florida beaches for vacation. And in case you needed more reasons to visit Florida, the Scenic Suitcase blog has you covered! I’m intrigued by this article and have never visited Marco Island. Do you know anything about spring break crowds there? We try to avoid those. We went on Spring Break last year and found it to be perfectly manageable. We, too, tend to avoid places with large crowds. It’s a lovely place, especially the JW Marriott! I thought you were going to have an actual checklist here. I would like to know what you know about snorkeling in Marco Island. We plan to take our two grandchildren ages 13 and 10 and would like for them to see some really colorful fish. Any suggestions?